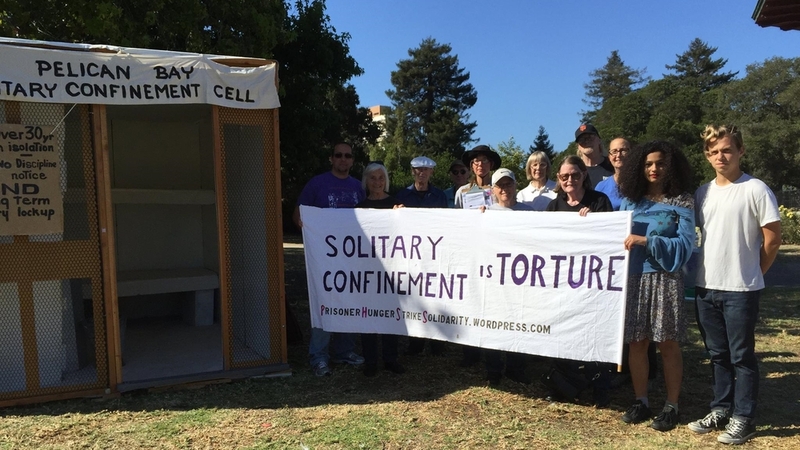 Communities across the country are joining Together to End Solitary Confinement. Join in coordinated actions every 23rd of the month for the 23 or more hours people spend in their solitary cell every day. Find out more about the Together to End Solitary national movement. See what is already planned and submit an event in your community. On April 22, 2018 over 200 people attended the UCSC opening of the Reel Work May Day Labor Film Festival (RWLFF)’s 17th season, with the event theme Together to End Solitary. RWLFF celebrates working together to improve the conditions of our lives, and focuses on work: waged, unwaged, and the slave labor of incarcerated and convicted people, legalized by the 13th Amendment. On Friday, December 22, the New York Campaign for Alternatives to Isolated Confinement (NY-CAIC) held its second annual caroling event at Governor Cuomo’s office in Manhattan. Advocates at the event urged Governor Cuomo to support restrictions on time spent in solitary confinement to 15 days and develop alternative solutions for incarcerated persons who need longer periods of separation from the general prison population. "Solitary: Inside Red Onion State Prison"
On February 6th, HBO will premiere “SOLITARY: INSIDE RED ONION STATE PRISON.” A compelling and haunting documentary from award-winning filmmaker Kristi Jacobson, SOLITARY takes the viewer inside one of America’s notorious supermax prisons to expose the horrors and dehumanizing effects of solitary confinement. You can view a trailer of the film here.